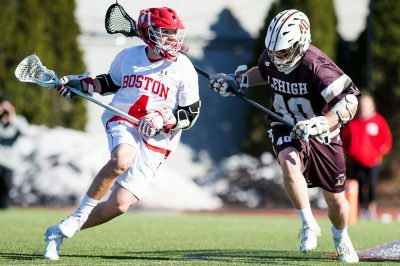 The Boston University men’s lacrosse team opened their season Sunday afternoon in Rhode Island with an 8-7 win over Providence College. This is the fourth straight time the two teams have met for their season openers, and the fourth straight time the Terriers (1-0, 1-0 Big East) have won. “I’m just really proud of my group, of the fact that we found a way to win when we didn’t play our game,” BU head coach Ryan Polley said. The teams headed into the game evenly matched, tied 40-40 in their all-time score and having had very close games in their last two meetings. This time around, the Friars (0-1, 0-0 Big East) came out fighting but fell short. The first five minutes of the match were back and forth with shots that could not find their way to the back of net. Sophomore attack Chris Gray came out strong for the Terriers, netting two goals within 1:14 of each other in the middle of the first period. With five minutes remaining in the opening quarter, Providence attack Matt Grillo responded with a goal to make the score 2-1. The Terriers got their two-point lead back when senior attack Brendan Homire dished it to freshman attack Jack Collins two minutes later to extend the Terriers lead to 3-1. Providence answered quickly to make it 3-2, but BU responded with another goal from Collins to increase their lead to 4-2. With two minutes remaining, Providence slipped in another to end an eventful opening quarter 4-3. In the beginning of the second quarter, BU’s defense came out strong but could not hold back Friar midfielder Nick Shaw from rolling the crease and bringing the score to a tie game. The Friars secured their first lead of the game five minutes into the half, riding on a one point advantage for the next four minutes. The Terriers continued to move the ball around the crease at the quarter progressed, and just after the seven-minute mark senior attack James Burr ran in with a left-handed shot to make it a tie game. With 50 seconds remaining in the first half, Providence held the ball to gain a final shot on goal but could not find the back of the net. At halftime, the two teams were tied 5-5. A quiet third quarter saw Providence score with 4:16 remaining to take a 6-5 lead. The Terriers, unable to score for more than 21 minutes, came back fighting in the fourth quarter. Forty-one seconds into the period, Gray secured a hat-trick on the day to tie the match up at six apiece. With 6:08 remaining in regulation, Burr scored again to give the Terriers the lead, then freshman midfielder Jett Dziama ripped a sidearm shot for BU to bring their lead up 8-6. Providence senior attack Brendan Kearns stopped BU from keeping their two point advantage, scoring in the last few minutes to bring the Friars to a one point deficit. A flag was thrown on Providence to give the Terriers a man up with 58 seconds left in regulation. Despite the physicality between the two teams at the end, though, BU came out with the win. Polley said the Friars’ strength and athleticism forced BU to make a lot of mistakes throughout the game. “We were really sloppy in the middle part of the game — we turned over the ball quite a bit on the clear and certainly some 6-on-6 possessions but kind of regrouped at the end of the third quarter and played a pretty sharp fourth quarter,” he said. Junior goalkeeper Joe McSorley totaled a career-high 24 during Sunday’s match. Polley said McSorley was strong throughout the game, making all of the necessary saves. After winning their season opener, Polley said that BU is in good spirits before heading on the road to Ohio State on Feb. 9.